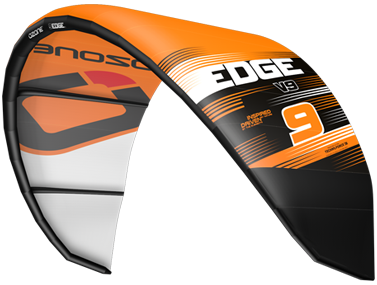 The Edge is a no compromise design; we wanted a kite that is as refined as a race car in terms of high end performance. The sleek low drag planform combined with our high power airfoil section results in a kite that is fast, powerful and dynamic. The addition of our new low drag Aramid bridle lines takes the Edge one step further, these bridle lines are 50% thinner than the standard bridle line and gives the Edge a turbo charged feel. The power the Edge generates and delivers is unmatched. If you like to send it for big air and hang time the Edge packs an awesome punch, putting you higher and for longer than you can imagine. The speed and power are easily converted into height, and its high performance airfoil gives you plenty of float which extends your air time. If you like going really big, then hit a small wave at full speed, send it at the same time and I guarantee you will be higher than you have ever been… naturally! The Edge is not only a freeride performance machine. In the Race scene it has more than proven its pedigree, consistently helping riders take the top three steps of Championship podiums all over the world. Results speak for themselves and the Edge has more than any other ‘race kite’. For committed racers our new Race Control System allows the Edge to be trimmed on the fly while fully powered and in position. The double pulley design enables easy micro power control and adjustment allowing you to hold your line at all times. The beauty of the Edge is that anyone can enjoy its performance, not just racers. It is a great light wind kite on a twin tip because of its amazing power generation. I can frequently ride the 9m while other riders are struggling with 12m kites, and as soon as the wind picks up you then have a boost machine! The ultimate Kite Racing accessory, custom designed in collaboration with our elite Race Team including the worlds top Kite Racers. Utilising top of the line components and materials the Race Control System is smooth and reliable on the course. Incorporating a double pulley system offers minute trimming on the go, allowing the racer to hike out maintaining maximum power against the fins. Added benefits on the Race Control System include our proven Flag Out Safety System with the Megatron Quick Release Chicken loop, offering simple flag out release of the kite. The release exceeds all Kitesurf loading and release EU NORM safety standards. 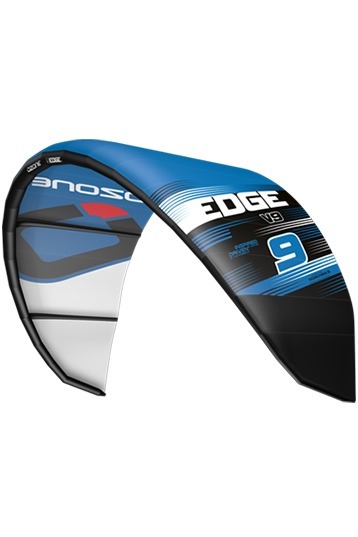 We tested the Ozone Edge 13m as a light wind kite besides 5 other brands. The 13m was the smallest of all and still had a good low end! It had the most depower and the widest wind range of them all. It's a race kite that reacts not so fast and has a wide turning circle. Scroll down to see the characteristic review! One of the best kite in the world. Kite all around, super stable for race. Last season was the Ozone Edge my low wind kite. Had great fun with it. Great glide, wind range and depower. Great low-end and in 16 knots or above it's still ride-able. Little bit slow in the kite reaction but I adjust easily. Racing? Well I didn't ride races but bought it as a light wind kite.